The latest of CORE's Ten Trends has just been released, focusing on the issue of placing the learner at the centre of all decision making and activity in our education system. A learner oriented system requires reversing the “logic” of education systems so that they are built around the learner, rather than the learner being required to fit with the system. The video above is available on EdTalks, and provides a useful introduction to the issue – great for use in staff meetings or other gatherings of educators interested in re-conceptualising how our educational institutions and programmes may better serve the needs of students. It's official… excellent teachers, supported by gifted and visionary school leaders, keep students engaged in the learning process and hopeful about their future. These are two of the crucial outcomes the recent Gallup Student Poll measures. 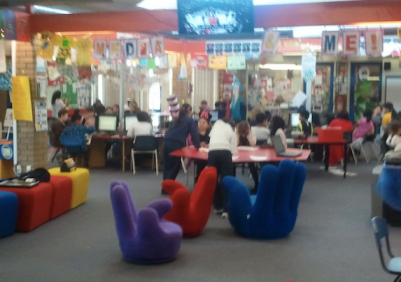 I was speaking with a school principal yesterday who is working to develop his school's strategic focus for next year. Placing student achievement as the overarching priority for the school, his focus moved to student engagement as the critical success factor for the cohort in his school. Our discussion then moved to what the indicators of engagement might be that he and his staff could agree should be the focus of their efforts in 2015. The criteria used in the development of this Gallup Poll could be a useful starting point – they ask students, teachers, principals, and other professionals about their levels of hope, emotional engagement, and well-being at work or school. Using these criteria as a guide provides a useful framework for developing a shared understanding of engagement and what it looks like in the classroom. Unfortunately, our system tends to stress the indicators of 'dis-engagement', drawn primarily from the Behavioural Engagement category – including stand-downs, suspensions and exclusions. And so the focus on engagement becomes more a case of "how can we mitigate these things occurring?" instead of "how can we increase the extent of engagement, behaviourally, emotionally and cognitively?" According to the Gallup survey, and using their wide range of measures, 55% of American students scored high on engagement. That's a pretty disappointing score in anyone's book I feel. I wonder what the equivalent might be in NZ schools? Across the board? And in specific schools? I imagine we'd find a wide range of results – but the fact would remain that every child represented in the percentage of un-engaged, or dis-engaged is a child unlikely to achieve in his or her academic studies either. One of the key findings from the Gallup survey is that students who strongly agree that their school is committed to building students’ strengths and that they have a teacher who makes them excited about the future are more engaged than their peers who strongly disagreed with both statements. Again, no surprises, with clear messages there about taking a learner-centred approach, and promoting student agency – and for teachers, that their relationships with the learners, and their interest in and passion for what they are teaching is 'infectious'! The contentious aspect of this logic is another finding in the Gallup research, which reveals that, unfortunately, most teachers are not in a position to share excitement with students. About 70% are classified as disengaged, which, according to the report, puts them on par with the workforce as a whole. It had to happen… after decades of pursuing 'modern learning practices' in developed nations, the pendulum appears to be swinging (in the UK at least) back to adopting the age-old approach of 'chalk and talk' as the pedagogical approach of choice. And the reason – that this is the approach found in China where the students are achieving on average at a higher rate than their western counterparts. Professor Alan Smithers, director of the Centre for Education and Employment Research at Buckingham University, said: "English education was overtaken with progressive ideas in recent decades, which held it was better for children to learn by themselves and at their own pace. This was clearly madness, and it has taken 40 years to realise this." So that's it then – let's sit back and watch the pendulum swing. With politicians and university professors professing it to be so it must be correct – right? Wrong. Let's put a bit of perspective on things shall we. Fact – many schools in the UK (and NZ?) have struggled to fully realise the promise of the 'personalised' approaches to education that have been promoted in recent decades, due to a combination of factors including parental expectations, lack of professional development and the impact of standards-based assessment regimes. Fact – the Chinese (Shanghai and Beijing that is) have outscored pretty much everyone in the recent PISA results. Shanghai parents will annually spend on average of 6,000 yuan on English and math tutors and 9,600 yuan on weekend activities, such as tennis and piano. During the high school years, annual tutoring costs shoot up to 30,000 yuan and the cost of activities doubles to 19,200 yuan. Before we get too carried away with simplistic 'cause-effect' arguments about what makes for an effective education system, we need to wrestle more profoundly with some of the deeper and more fundamental aspects of our education system – which, as it happens, have been the focus of some of my recent blog posts. Consider the question "What is the purpose of education" an the opposing philosophies that I outlined in that post. Could not the move to enforce a 'chalk and talk' model of education reflect much of what is suggested in philosophy A, where the system is perceived as broken, but can be fixed fast – and teachers also! Or consider the question of "What defines success?" in our system – is it purely examination results (based largely on the regurgitation of memorised, transitted knowledge)? The PISA results provide some useful international comparisons of achievement that is measured using a particular metric – but should our overall assessment of a country's success be attributed to that? And what about the idea that individualised programmes are a fad of just the last couple of decades? I'm sure the significant educational theories who've influenced our thinking and system design with constructivist and social constructivist theories would have something to say here. Key theorists who started this thinking (Dewey and Vygotsky) were actively researching and presenting the case for more participatory, authentic and personalised approaches to learning a century ago. At the end of the day decisions such as the announcement yesterday from the UK will be driven not by the theorists or educational philosophers – or even teachers and principals in schools, but by politicians and bureacrats, looking for the 'quick fix' solutions. As a profession we need to be ready with a response that is formed out of our professional discourse, backed up with evidence from our practice. In the absence of those things, we're destined to being subject to the whims of whatever the next 'big idea' is that happens to emerge. Here's a gem from Digital Learning Now with the text of News Corporation Chairman and CEO Rupert Murdoch's address to the e-G8 Forum in Paris on 24th may this year. Murdoch urged Internet companies to pull out the stops in developing digital education programmes to revolutionise the world's classrooms, complaining that pupils are still condemned to dreary "Victorian-age" classrooms despite the potential of the web for revolutionising education. I haven't often felt aligned with what this chap has had to say, but there's some compelling stuff in this talk. He holds nothing back, accusing schools of being the last holdout from the digital revolution. he argues that simply throwing money at the problem doesn’t work (and cites his own experience of having tried this as proof.) To those who argue that the problem is the kids – that they're too poor or from bad families – he responds strongly with "…absolute rubbish. This is arrogant, elitist and utterly unacceptable." His solution is straight forward, and has a sound pedagogical basis; "Every study will tell you that the more interactive and intimate learning is, the better the student will perform." The key here? Software that will engage students and help teach them concepts and learn to think for themselves. Murdoch also argues the case for personalisation as a second key to resolving this. In our own backyards, we have millions of young people whose minds are the key to our future. It is time to insist that our schools use every technology we can to unlock their potential – and treat them as the precious resource they are. Certainly something for us to think about – for those outside education, how we can respond with resources that will meet this challenge, and for those inside, to stop defending the status quo and opening the doors for this sort of learning to happen. Over the past few years I’ve frequently heard the comments; “It’s not about the technology, it’s about the pedagogy”, or in relation to the advent of ultrafast broadband; “we’ve got to drive it from the teaching and learning.” These are well intended sentiments, but why is it that the technology still dominates much of the discussion, and so often becomes the starting point by default? And just what do we mean by letting the teaching and learning lead? How would you explain that to someone outside of education – or, for that matter, someone inside? Learn – This is the part of the learning process where learners are exposed to intentional teaching, access to content, the development of pre-requsite knowledge and skills etc. Create – this is where learners work with, manipulate and re-present the information they have gathered in the ‘learn’ scenario. This may be done independently or collaboratively, and may involve a range of tools and environments. Share – where learners communicate with others what they have learned, being especially aware of the audience. May involve a celebration of some sort, and feedback where appropriate. These three things are underpinned/supported by a comprehensive assessment process – both for and of learning. The assessment band is deliberately shown this way to emphasise the fact that it isn’t driving the learning, but is an integral part of the learning process. Ubiquity – focusing on learning that happens anywhere, any time, any pace and through/with any device. Learning is no longer confined to the ‘box’ of the classroom, the ‘fences’ of the school yard, or the period between 9-3 in a school day. It also reflects the underpinnings of life-long learning. Personalisation – learners in charge of their learning, with the ability to make meaningful choices about all aspects of what and how they learn. Also recognises the imperative on teachers, as learning designers, to recognise that all learners learn differently and in ways personal to them. Collaboration – recognising that the ability to work with others is an essential skill in a future-focused world. Acknowledges the theoretical underpinnings of social constructivism and connectivism, and the need to recognised and work with each other’s strengths (and weaknesses). Beginning in the ‘learn’ area, a school decides it is important that students have unfettered access to a broad range of online resources and materials to support learning in the classroom as it is required (just in time). Acknowledging the ‘ubiquity principle, the decision is that access should be available anywhere on the school premises, but shouldn’t be confined to the school day and school premises. This leads then to decisions about mobile, internet capable devices, school-wide wireless, cloud-based content servers and filtering solutions that aren’t unnecessarily restrictive. Although this isn’t a particularly detailed explanation, and there are a range of other factors and possible scenarios that could be developed to meet the original ‘learning’ need, you’ll get the point. The important thing is that the model is an attempt to initiate some dialogue about how we articulate our teaching and learning needs, and how they can then be appropriately supported by the technologies available to us. Very pleasing to see the latest Education Gazette featuring a story about Albany Senior High School and the success of their decision to run all of their school’s computers on open source software. I had the privilege of being involved with the school during its establishment phase and know just how much of a challenge it presented to principal Barbara Cavanagh and her senior team, including Mark Osborne, DP in charge of ICT and the person who has driven this process. The challenges weren’t just the technical ones. Some of the biggest challenges came through the change that the use of open source software brought to the established patterns of use, and to the existing beliefs and attitudes of staff and community members. I applaud what ASHS has done, as it represents a decision based on a highly participatory process of developing a school vision that is truly aspirational, including an approach that is truly learner-centric and sustainable. Well done ASHS team! View more presentations from dwenmoth. I was in Reporoa last week speaking to staff from five different secondary schools involved in an EHSAS contract about the ways ICTs can be used to support the development of key competencies as described in the New Zealand Curriculum. I’ve included my presentation above and embedded in the “Presentations” tab on my blog. The ideas I shared are very practical, and draw heavily on web2.0 tools and other online applications that can be easily accessed by students from home or wherever they have access to the internet – so they are able to continue exploring, creating, contributing and collaborating after the formal class session has been completed. For me this is the most exciting thing about using ICTs to support the key competency development – that they are tools that can so easily be put in the hands of learners, and do not require the use of specialist hardware or software installed on machines that can only be accessed during school hours etc. This is an essential first step towards seeing many of these key competencies fostered and developed through regular engagement. The Learning@School conference is rollicking along in Rotorua at the moment, with keynote speaker on day one, Andy Hargreaves, setting the scene with challenges to us all about the need to take account of the whole context and culture of our school when considering change and development. Pam Hook had the audience spell-bond also with her “Hooked on Thinking” ideas and strategies. Unfortunately for me I am missing the conference, and have had to rely on my Twitter feeds, text messages and the odd call to keep me posted. Having made it to the opening of the conference I’ve had to return home for family reasons. That didn’t stop the presentation I was scheduled to do from going ahead – with my colleague from the Ministry of Education, Douglas Harre, stepping up to share thoughts, insights and ideas based on CORE’s Ten Trends for 2009. 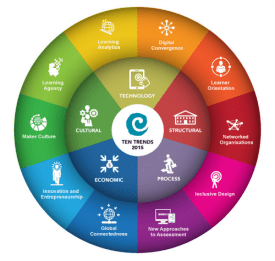 This is the annual list of trends developed by CORE staff to represent a view of some key areas of interest for NZ educators with regards to the impact of ICTs on teaching and learning. 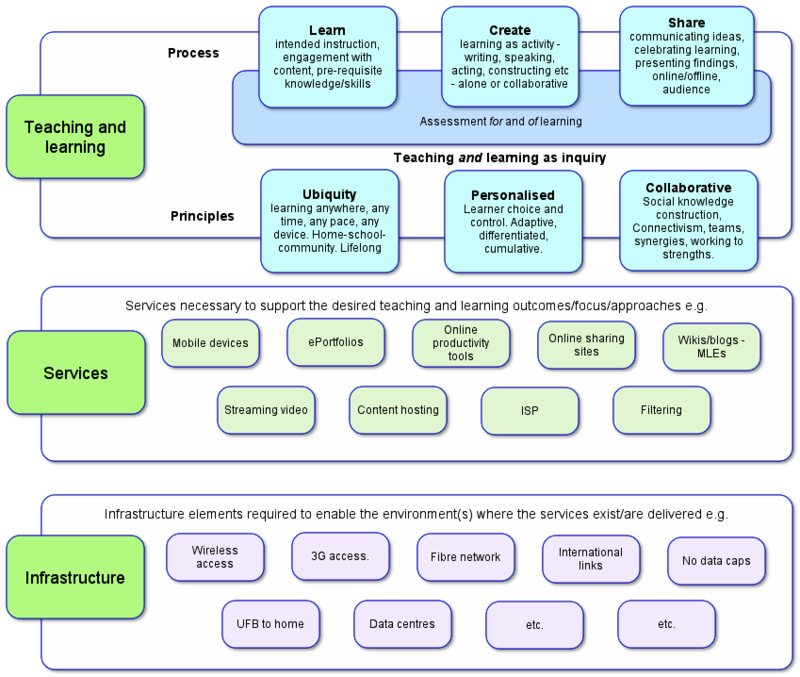 I’ve just spent the day in Wellington at various MoE meetings – a couple of long term projects kept surfacing, the Ministry’s Personalising Learning initiative and the work of the Virtual Learning Network – both are things I’m pretty passionate about, and in an interesting way, both are inextricably linked. writing for the national College of School Leadership in the UK, Charles Leadbetter explores the link between personalised learning and collaboration in a publication titled “The Shape of Things to Come“. I’ve found this publication very helpful in the development of my own thinking. As I’ve participated in the development of the Virtual Learning Network over the past five years the two major drivers behind its design and operation have (a) collaboration between and among schools, and (b) meeting the needs of individual students – personalisation. The frontline learning is not the classroom, but the bedroom and the living room. Our education system’s biggest untapped resource is the children themselves. Innovating a personalised learning offer will only be possible with matching organisational innovations in how schools operate. Collaboration is key to that. Personalised learning schools equip children to become more active, engaged learners, able to reflect on how they learn, what they find hard or difficult, how to best express themselves. Collaboration will only deliver if it becomes more radical and ambitious, It is not an attractive add-on, but a different way to do the school’s core job. Collaboration can be held back by regulation, inspection and funding regimes that encourage schools to think of themselves as autonomous, stand alone units. Collaboratives of schools and children’s service providers should become basic building blocks of the system: employing staff, deploying them, planning provision, making admissions, offering choice, sharing platforms and services.